I must have chicken on my mind. This month’s issue of Cooking Light highlights chicken 25 ways, which reminded me of a recipe from the September issue that I wanted to try: Chicken with Honey-Beer Sauce. Yep, the recipe contains beer and my kids ate it. But before you turn me in to the authorities, realize all of the alcohol evaporates out as it reduces. The resulting sauce is a rich, comforting, sweet and salty combination. Here in the Lou (arguably the beer capital of the world), we are fortunate to have a wide variety of really good local beer options. I used a less known microbrew from the outskirts of St. Louis, mainly because I had it on hand. It would be fun to see how the flavor profile would change based on the type of beer used. Although it is not easy to eat locally in the middle of winter, it’s not impossible. This recipe contains staples such as mustard, honey, onions, and beer, all produced in areas close to the Lou. Thankfully many farmers are using hoop houses to grow vegetables during the cold months. I purchsed some locally sourced carrotsthat I served lightly steamed, with a squeeze of lemon juice and a drizzle of honey. Oh- and before you go… remember this quite unusual burger? 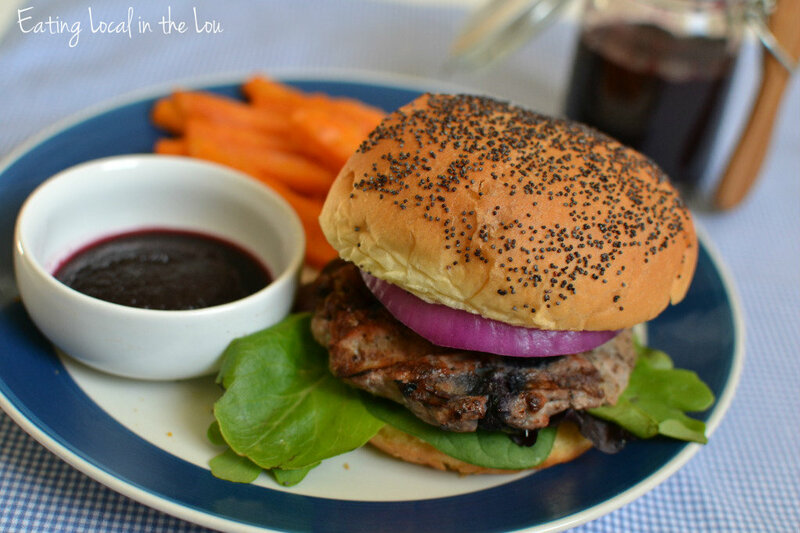 A few days ago I found out that my Succulent Blueberry Turkey Burger with Ginger and Lemongrass served with Blueberry Ketchupwon the Savory Grand Prize in the Mama’s Plate Update Blueberry Blogger Recipe Contest. I was freaking-out-excited when I got the call!! (Acceptance speech): I’d like to sincerely thank the U.S. Highbush Blueberry Council for this big honor and for thinking that my original recipes were tasty enough to win. I’d also like to thank my friend Dawn for the idea to add the lemongrass. I agree Dawn, it's what made the recipe award-winning! Heat oil in skillet over medium-high heat; add chicken, sprinkle with pepper, cook about 6 minutes on each side until done. Remove chicken from pan. Add onions, cook about 1-2 minutes until translucent. In a small bowl, whisk together beer, soy sauce, mustard and honey. Add mixture to pan, bring to boil, gently scraping pan to loosen brown bits. Simmer liquid until reduced, about 4 minutes. Return chicken to pan, to coat with sauce.